In this video I show how to replace two 3way light switch. 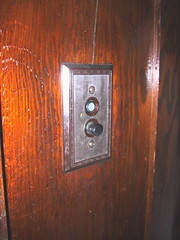 The original switch were the old knob and tube push-button type switches. Ideally this wiring should be replace. The wiring was originally installed before the 1930's. This client was not in a position to update the wiring so were were able to repair the switching problem with new switches. Knob and tube wiring is nearly 100 years old now. It is highly recommend that this type of wiring be replace when it is located.